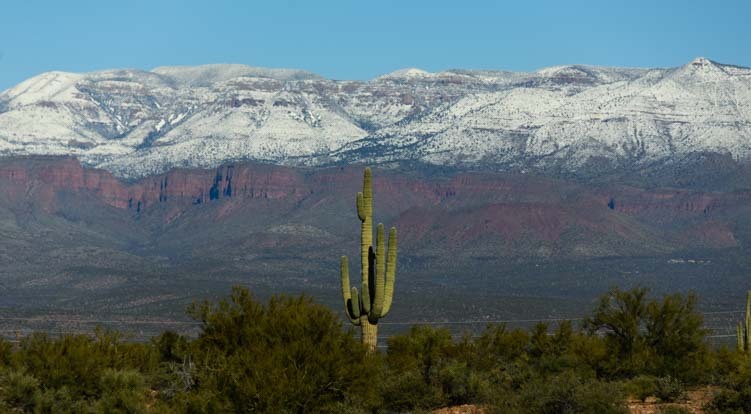 Snow in the Arizona Desert – A Beautiful Fairy Dusting! 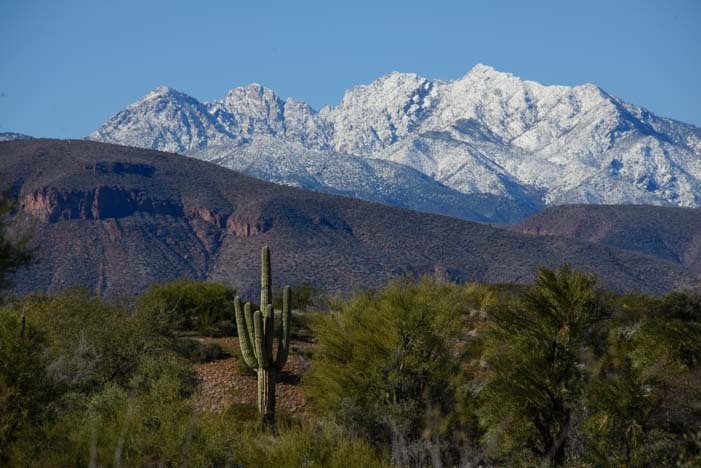 January 2016 – A lot of folks that have never been to Arizona think of it as a very hot and dry place. That’s true in certain parts of the state at certain times of the year, but it isn’t always so! 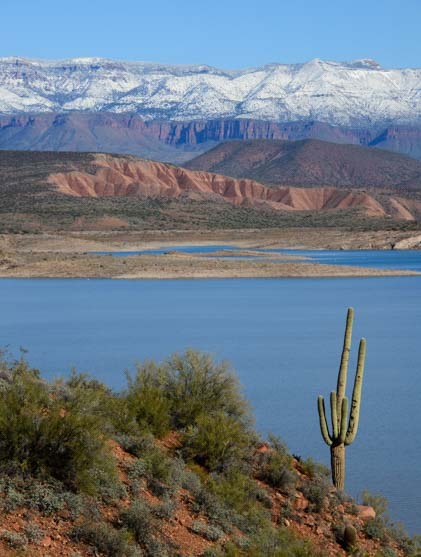 Snow and mist cover the mountains east of Phoenix, Arizona. This past week the humidity level stayed above 80% for five straight days, and the rain fell relentlessly. 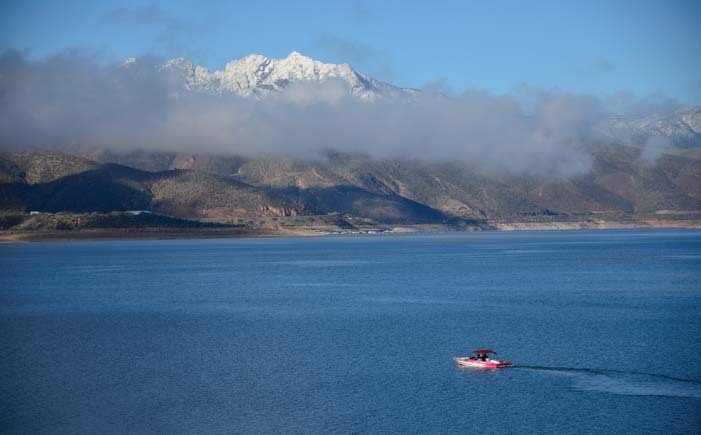 What a gorgeous morning on Roosevelt Lake! 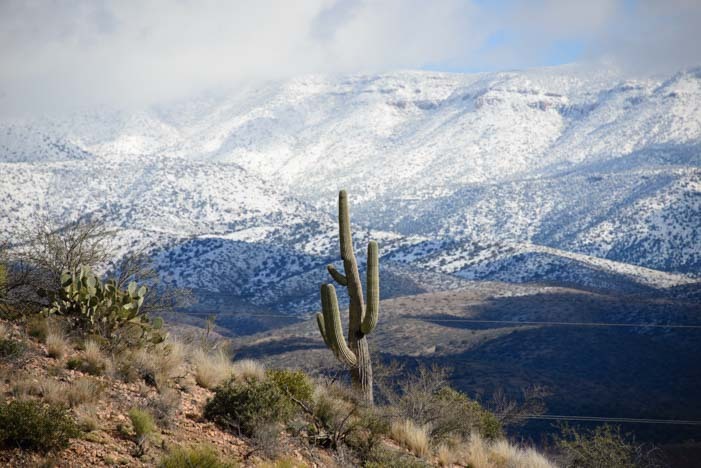 The stunner of it all was that this moisture showed up as a beautiful blanket of snow in the mountains around the desert floor. 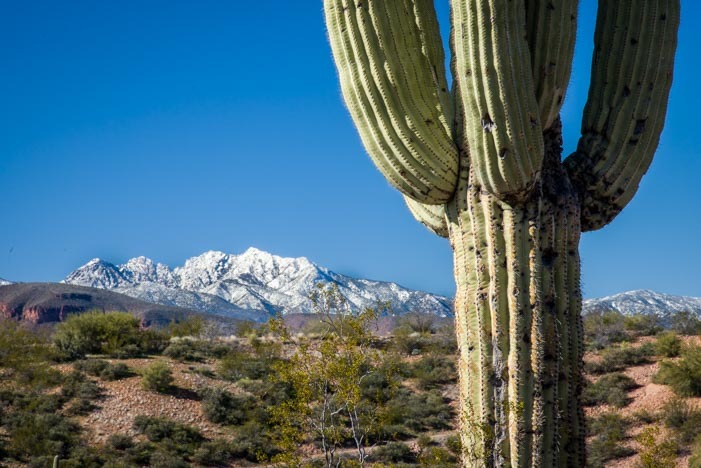 A lone saguaro cactus looks up at the snowy mountains in the distance. 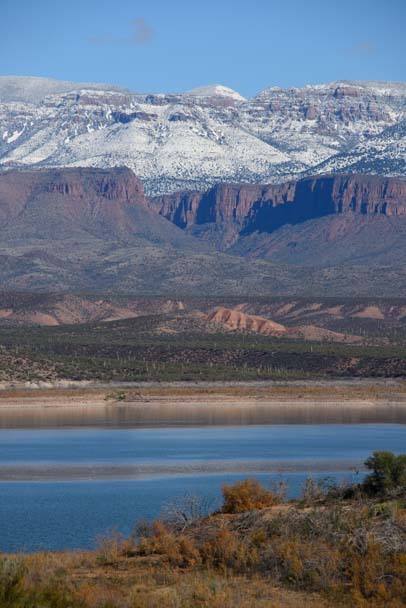 This is a spectacular area at any time, but snow really sets off those mountains! What a great reward after a soggy week in our RV. We threw open the windows, even though it was only 50 degrees out, and let the sun pour in! 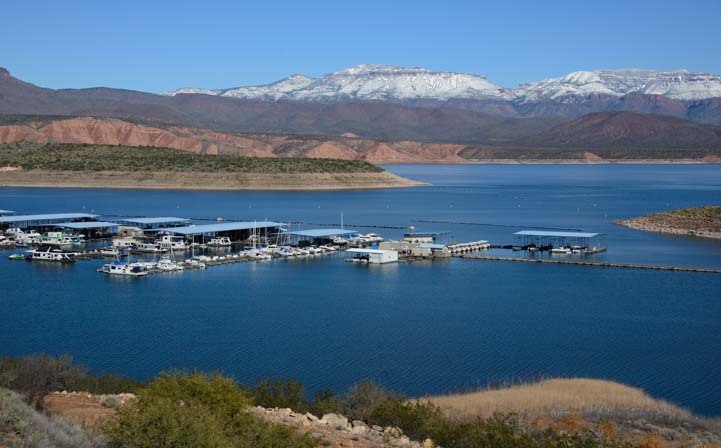 Roosevelt Lake Marina – boating between snowy peaks! This part of the desert can hit 120 degrees at the peak of summer, but the overnight lows have been flirting with the freezing point on the thermometer all this week. 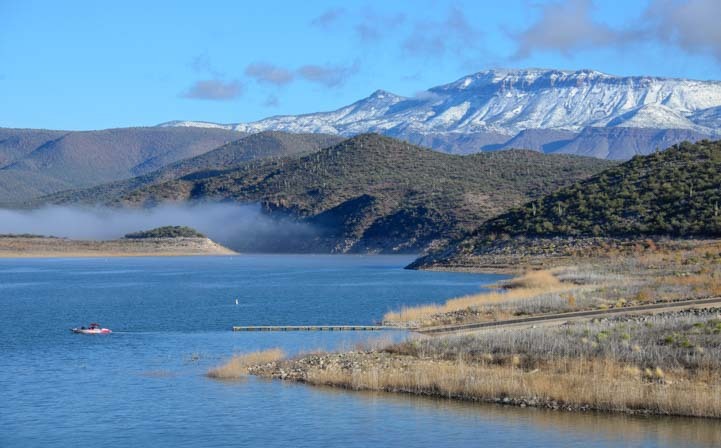 Nonetheless, the occasional die hard boater has cast off on Roosevelt Lake. An enthusiastic boater takes to the water on the first day of sunshine. 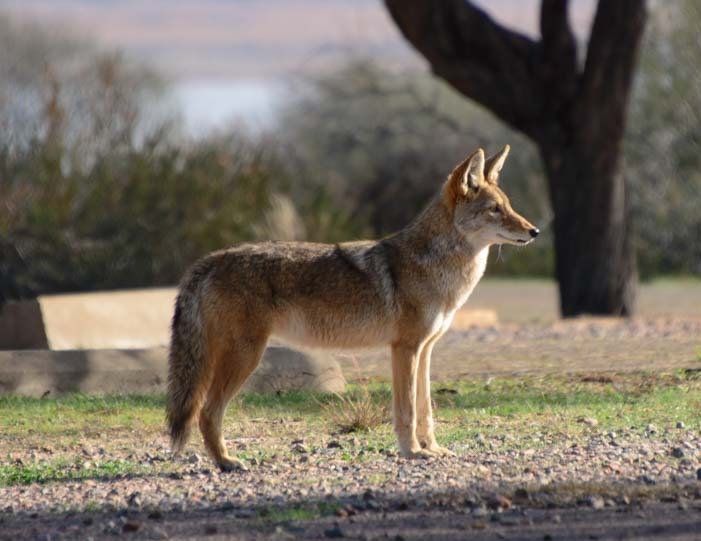 A pack of coyotes lives nearby, and we’ve been hearing them a lot in the mornings and evenings. The other day we spotted one just a few feet away. 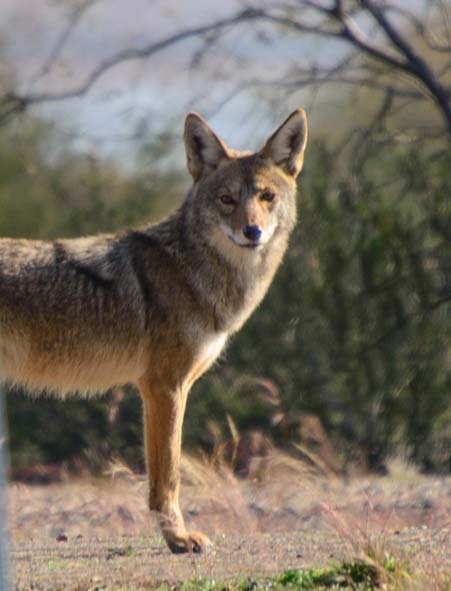 A pack of coyotes has been singing and yipping a lot around us lately. What a gorgeous animal! I was delighted when he turned to look at me. And the scenery wasn’t bad either!! We hopped in the truck to take a drive and were amused to see cars and trucks coming down from the mountains with snow on the roofs. 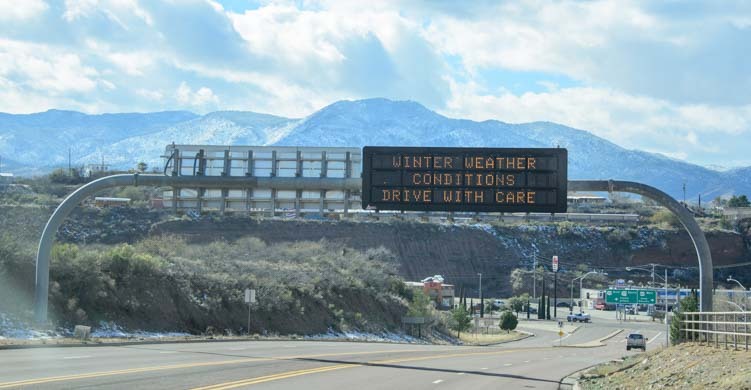 There were winter warnings for drivers too. When we crossed one mountain pass we could tell the snowplows had been busy the night before. Wow! Snow doesn’t last long in these parts, so we snapped as many pics as we could. 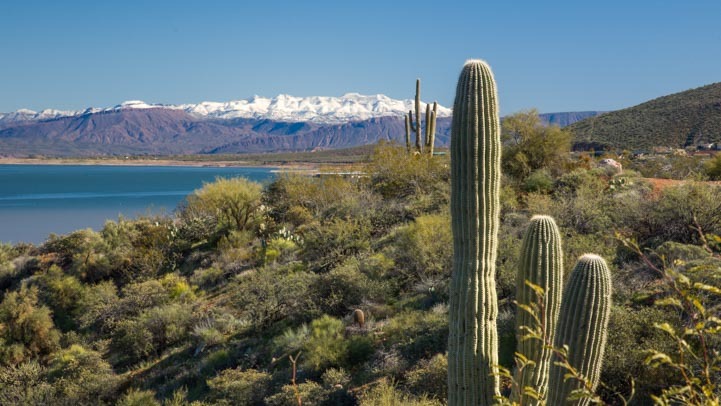 This area is beautiful at any time of year, but the backdrop of the snowcapped mountains with the saguaro cactus and Roosevelt Lake was just fantastic. Crossing the mountains on our way to Globe, the distant rippling mountain peaks were covered with snow. 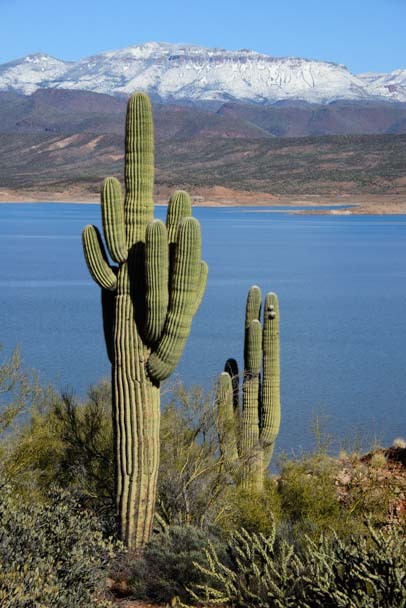 This saguaro has upright arms. When one has a droopy arm, it’s often because snow or ice weighed it down for a while! This was a wonderful fairy dusting of winter. Just enough to give us the beauty from a distance without having to shovel! 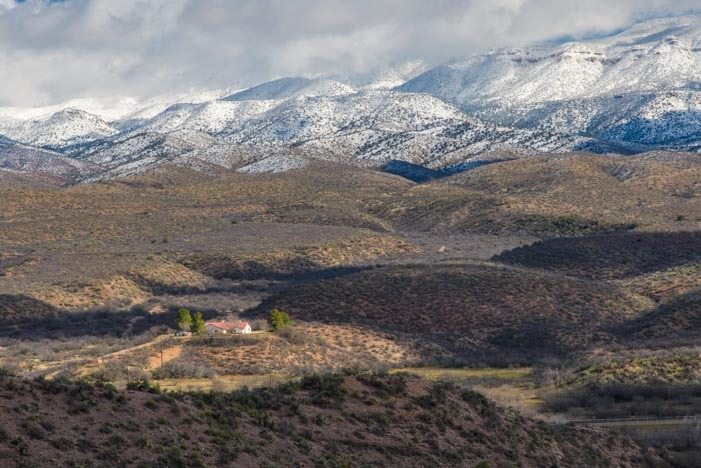 The daytime temps warmed up to the low 60’s and the snow began to vanish from the peaks in no time. But what a neat few days we had here in “hot” and “dry” Arizona!! The snow won’t last long, but it gave us a lovely winter interlude! 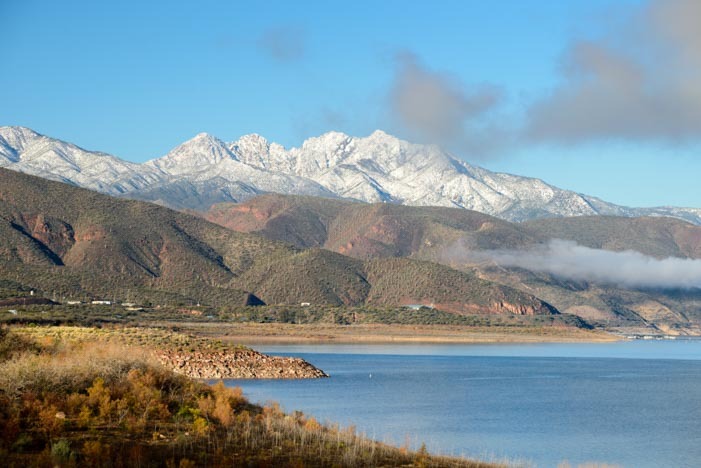 Golden Hues at Roosevelt Lake in Autumn – No snow here!